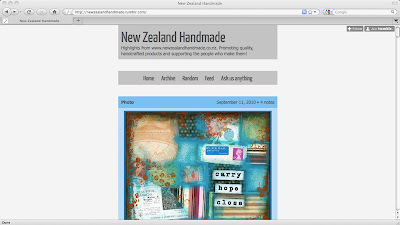 New Zealand Handmade: Have you met our Tumblr? Have you met our Tumblr? If you're one of our more observant readers you will have noticed way down on the left side of our home page a link to our Tumblr. To those of you less observant, or less curious, I'm here to introduce you. I'm the curator of our Tumblr, the job having fallen to me because I was the one who suggested having one, and I was the only one of our group who had ever heard of Tumblr. So don't feel left out if you've never heard of it either. Tumblr is a blogging site, kinda a cross between Blogger and Twitter. You can post content, you can "follow" other tumblogs, you can "like" people's posts, and best of all, you can "reblog" posts. The reblog is the heart of Tumblr, allowing your post to become other people's content, and hence other people's followers to see your content. There are three main types of Tumblr users... Those who post only new content, those who only reblog, and those who do a bit of both. Tumblrs that are mainly reblogs usually represent the interests and passions of the person well, or else are great compilations of a certain subject. For this compilation type blog there's a Tumblr tradition of giving the blog a name I won't be sharing here, but click through to this one of origami, or this one all about New Zealand to find out. A large part of the appeal of Tumblr is the ease of posting, the ease of finding interesting content, and the ease of forming a community. Like Blogger, everything is done from your Dashboard. You pick which type of post you want to create from the icons. For the New Zealand Handmade Tumblr I pretty much post photos from this, our main blog. I also grab random items from our shops, and the shops of Friends of NZHM. I always tag posts with "New Zealand" and "Handmade" as well as other appropriate keywords so that people searching Tumblr can find us if they're interested. You can see above that I'm following 140 people. Their avatars are at the bottom of our Tumblr. They're all people who seem, based on what they post, interested in art or handcrafted things or New Zealand. I found them by searching Tumblr (that search bar at the top right of the dashboard, click the arrow to change "My Dashboard" to "Tumblr" to search all of Tumblr). Following them allows their posts to show up on my dashboard, which I love perusing, but it also serves as a way to have them notice me and my tumblog. It's the best way to get followers, of which we now have 53! It's so hard to keep up with all the different networking websites out these days, and half the time it's not even worth the effort involved in signing up. But I think that Tumblr's a keeper. I've been tumbling my own personal ramblings for over a year now, lots of major news/media outlets have a Tumblr (for example Newsweek, the New Yorker) and musicians do, too (such as Amanda Palmer, and John Mayer, who recently posted about his Tumblr addiction).